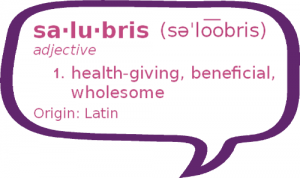 Why the name Salubris Speech Therapy? It is the personal conviction of the owner of Salubris Speech Therapy that therapeutic intervention should be health-giving and wholesome, with an approach as personalized as the individual being served. We know what it’s like to be the parent of a child with a communication disorder – the confusion, the worry, the desire for an effective treatment program that will make the most of your child’s time in therapy. We have worked closely with family members of victims of stroke who required rehabilitation to regain such basic skills as speech clarity, language skills, problem solving, and memory. At Salubris Speech Therapy, we develop personalized intervention plans that target improvement areas with the whole person and situation in mind. The field of speech-language pathology is vast! At Salubris Speech Therapy, we only serve the domains of speech, communication, cognitive, voice, and swallow function with which we have experience and expertise. If we feel we cannot best serve your individual needs, we will not hesitate to refer to a well-suited colleague. If you are searching for a speech-language pathologist for yourself or your loved one, look no further – contact Salubris today!